CHARLES KELLY (Charlie) attended St. Finian’s College in Mullingar before graduating from N.U.I. Maynooth with an honours degree in English and History. 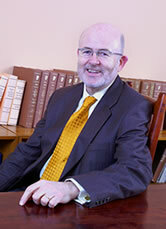 Following his apprenticeship, on admission to the Roll of Solicitors in 1974, he returned to Edward A. Kelly & Co., the family firm established by his father. Charlie has built up considerable experience in many areas of law over 34 years of practice, in particular, Conveyancing, Litigation, Licensing and Probate. In addition to his legal experience, Charlie trained as a marriage counsellor and was involved in remedial counselling for a period of ten years. Charlie is currently President of the Midland Bar Association, the representative body for solicitors in Westmeath and Offaly, which represents their interests to the Incorporated Law Society and organises continuing education for members of the profession. Since his time in St. Finian’s College, Charlie has been well known for his performances on stage in musicals and likes going to the theatre. A keen skier, Charlie also likes to cook and tend his garden for relaxation.